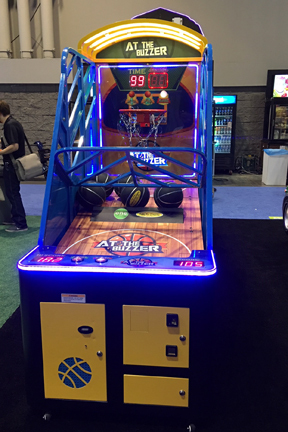 Rent At The Buzzer Basketball Arcade Game - a 1 or 2 player basketball game with moving hoop for your event in the Rockville Gaithersburg Potomac Frederick Baltimore MD Washington DC Fairfax Arlington Alexandria VA area. At The Buzzer Basketball A great addition to any basketball theme party or arcade game night. Each game consists of (3) rounds. In each subsequent round, the basketball hoop moves from side to side - more distance and faster, to make the game more challenging and fun. Great for kids and adults alike! 2 game units can be linked for head-to-head competitions.